Thanks to an assist from the Kremlin, Cinderella – that is to say Sepp Blatter – will go to the ball in Russia next year after all. Despite serving a six-year ban from all football-related activities after being found guilty of corruption during his time in office, the deposed ex-FIFA president will still be attending the 2018 World Cup after receiving a personal invite from Russian president Vladimir Putin. Blatter is also still under investigation in Switzerland over allegations into his “criminal mismanagement” of FIFA, if you can even fathom such a thing. I will go to the World Cup in Russia. I received an invitation from President Putin. I don’t know how long I will go for, whether I will be there for the opening match or the final. Because I can’t work in football and I don’t have an assignment to do, maybe I will only make a short visit. Dmitry Peskov, a spokesman for the Kremlin, also confirmed that Putin has extended a similar invite to ex-UEFA president Michel Platini, who was also found guilty of making “ethics breaches” and banned from football for four years in 2015. 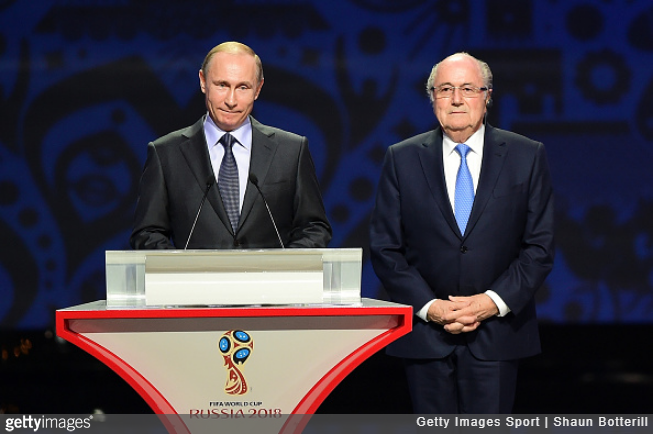 Peskov added that Putin will welcome both Blatter and Platini back as “old friends”.